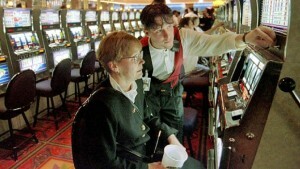 Up until the late 2000s, it was common to see dozens of slots workers at major casinos. Back then, you’d see casino employees scuttling around doing hand payouts (over $1,199), taking care of VIPs, taking change from machines, and exchanging cash for quarters. But look out across any slot machine floor today, and you’ll see very few casino workers in the actual slots section. Ticket-based slots happened. As I discussed over the weekend, IGT launched ticket-in-ticket-out slots at the turn of the millennium, negating the need for so many employees. No longer do we or casinos need to worry about mountains of quarters, with tickets being redeemed at worker-less kiosks. Casinos don’t need people to empty change out of machines, take the change to the designated area, and give coins for cash (or vice versa). Employees are still needed to load tickets into machines and make handpays on prizes worth over $1,200. But even handpays happen less because more games are concentrated on offering frequent smaller payouts, rather than infrequent large prizes. Additionally, most slot machines require pennies, not quarters. Tickets and penny slot machines have been a boon for casinos, given that they encourage more play than ever before and less maintenance/workers. However, it’s also sad for the employees who once manned these positions and saw their jobs cut. But before you feel too sorry for the previous workers, also remember that this is a big reason why payout percentages have increased in land-based casinos over the years. With less workers to pay, casinos have been able to offer fair payback because they have less overhead to worry about. My only wish is that slots comps were also what they once were. Instead, it seems like casinos are getting stingier with comps due to the influx of casinos in the United States.